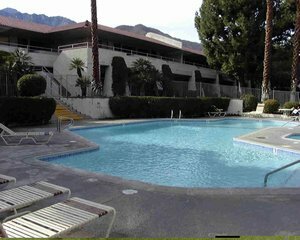 This upper unit condo is located poolside in the "A" building of the Palm Springs Villas 2 complex. It is beautifully decorated in a palm tree and sand motif. The Condo features light Berber carpet, sand-colored tile, new furniture, and a mirrored wall in the dining room. A 32-inch color TV dominates the entertainment center which also contains a DVD player and surround sound system. The cozy, homelike decor continues into the kitchen which is fully equipped with a microwave, coffeemaker, toaster, and all of the other comforts of home. The Bedroom is furnished with a queen-sized bed with a large dresser and mirrored closets as well as a 27 inch TV and VCR. Enjoy the greenbelt, pool and city light views from the Patio and beautiful mountain views from the pool. 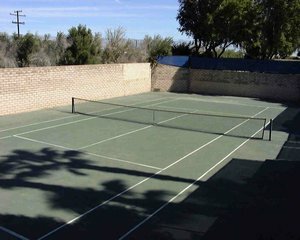 The complex is professionally maintained with on-site security. 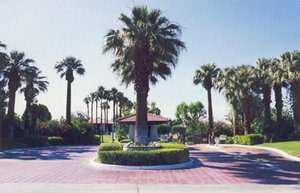 Your first weeks stay is $560 ($80 per night). Two weeks would be $980 ($70 per night). Three weeks would be $1260 ($60 per night). And stay for one month for only $1500 ($50 per night). Where else can you stay in a fully equipped executive 1-BR condo for $50 per night. We require a $100 refundable deposit to reserve your room.